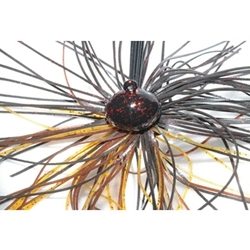 Santone's Football Jigs feature a durable powder-coating head, premium silicone skirts, and a dual rattle system, and a 5/0 Heavy-Wire Gamakatsu hook. These jigs are built around a super sharp hooks for lightning-fast penetration and rock-solid hook-sets. These football jigs have two rattles which provide additional fish attraction and a trailer keeper to keep your soft plastics firmly in place.